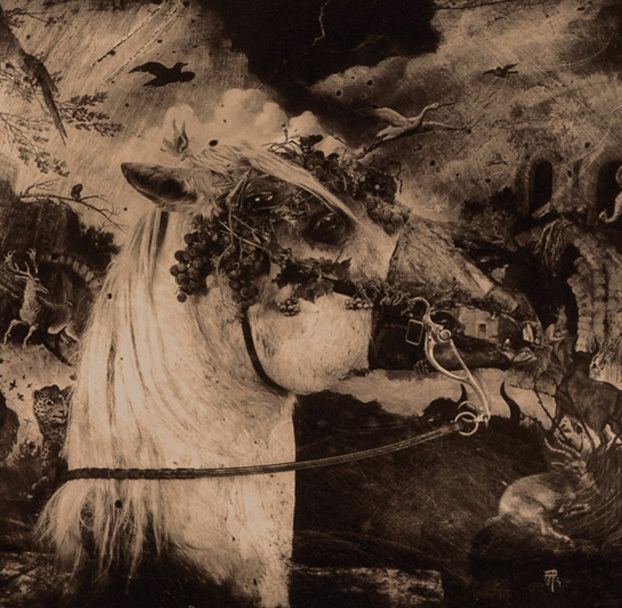 Fearlessly combining the beautiful and the grotesque, photographer Joel-Peter Witkin has earned a reputation for creating visually and emotionally powerful images. Born in Brooklyn, New York, in 1939 but based in New Mexico, Witkin is renowned for his ability to find a poignant delicacy in darkness, death and deformity. One of Witkin's images features as part of the design for our upcoming production of Blood Wedding. Set designer Rufus Didwiszus has long been an admirer of Witkin's work and decided to use the image (pictured above) as a backdrop in one of the scenes for the play by Federico García Lorca that fuses pastoral drama with mythological fantasy. "The photo was almost too good to use because it is like the whole play is contained in this one image," Didwiszus says. "It is so striking. The image is very emotional, more than just an illustration. Aesthetically his work is wonderful, but it's also very theatrical, which explains why people like us are drawn to it." It has often been reported that Witkin's inspiration comes from experiences early in his life, but the photographer says his ideas come from "reading, art history and the human condition". His process is lengthy and detailed, with each image the product of both strategy and fate. "I carefully plan the images, select the models, make the props and direct the construction and the backdrops," Witkin says. "But I keep everything loose. I want the models to react as well as all the happenstance, which are part of finding the best realities to create the camera generated image. That is the first part. The second is my making the print. After I choose the best contact print negative, I literally enter the image as I print it. That process can take several days to a month." Witkin's working process is as irreverent as his imagery and he uses numerous, often experimental, processes to create his extraordinary visions. "In printing, I may cut or scratch the negative, print through misted tissue or layers of glass in order to achieve what I find there," he says. "When the totality of emotion is complete, that image is the master print. All the other prints in the edition must match that." The results are undoubtedly challenging, but Witkin insists he does not aim to alienate his viewer. "I want to share what I have discovered with the viewer," he says. "I have been making photographs continually since 1970. My subject is the history of Western Civilization. I don't aim to shock but I do photograph intense subject matter in order to create indelible images because I want to make a contribution to life. I want to make life better. The meaning of the work is to show the splendor and misery of human existence but always with a redemptive purpose. That is what Shakespeare did in theatre. That is what Eisenstein did in motion pictures."